Hmm, not time travel, just plain old math. If the twins were born in 1995, then they're almost 15, and Jane had them when she was about 45. Yeah, no time traveling, just failure of anyone to update the entry. Shows the problem of stating anyone's age in something like a Wikipedia or IMDb entry; it's out of date almost as soon as it's posted. Anyone remember the film "Somwhere in Time"? Released back in 1980, it kinda bombed, but became a cult classic via a devoted fan base. It's an over-the-top romantic story about impossible love. Sound familiar? Turns out, there is an organization called INSITE (International Network of Somewhere in Time Enthusiasts) who started a group, a quarterly publication, eventually a website, and an annual meeting at the location where their film was shot, Mackinac Island, Michigan. I see numerous parallels to our own experience. Perhaps it's worth exploring. Just seeing this! This is my Mother in Law's fave film... I' saw it maybe about a year ago fter she raved about it and gave me the DVD - she says when she dies she wants the main love theme to be played in the church. It is very pretty. I must read this thread in full! When buying the book I realised that the guy who wrote it has written a lot of books that have been turned into movies.. I Am Legend with Will Smith and What Dreams May Come with Robin Williams. Also Duel but I havent heard of that film. 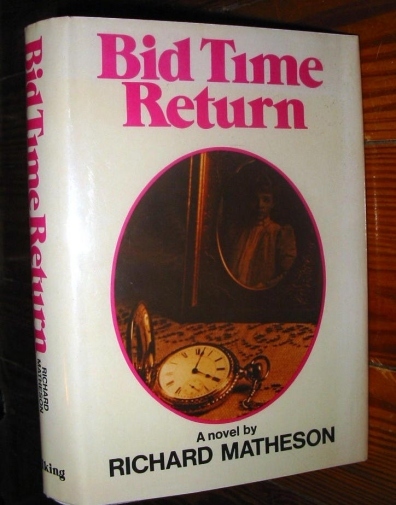 I just finished the novel by Richard Matheson, originally titled, "Bid Time Return", which comes from a line in Shakespeare's Richard II (act iii, scene 2): "O call back yesterday, bid time return." I'm getting intrigued to read the book. I checked Amazon and Borders for Bid Time Return and it was rather pricey, probably because it wasn't released in paperback. 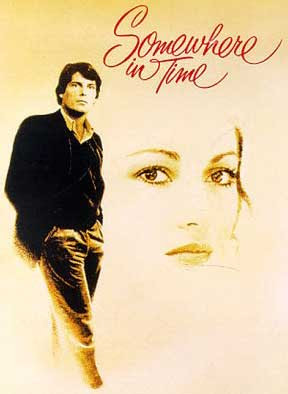 However, it was apparently re-released, titled Somewhere in Time. According to the plot summaries there were a number of changes between the book and film. That's right. I think "Bid Time Return" is more rare. It was re-released at the time of the film as "Somewhere in Time". I found an old, yellowed paperback for $1 on ebay. While the changes are significant between the novel and the film, Matheson did write the screenplay. He even has a cameo appearance as "Astonished Man". The twins would be 15 now, and she would have had them when she was in her early 40s. Entirely doable in this day and age. I'm just finding this thread. I remember a few years back, someone comparing Somewhere In Time with Brokeback Mountain, in terms of their fanbase, and the love affair. Now I (kind of) want to see it. "1993 to present: James Keach (with whom she had twins, Johnny and Kris, born November 30, 1995, and named after family friends, Johnny Cash and Christopher Reeve)"
She herself is nearly 60, how can she have 5 year old twins? I think there's more time traveling here than meets the eye. James Keach played the prison warden in Walk The Line, I'm pretty sure, the movie about their friend Johnny Cash. Interesting thing on IMDB.. the director asked all the females up for the part if they had ever been in love.. and Jane was the only one that said no. "Researchers have found evidence for “chronesthesia,” which is the brain’s ability to be aware of the past and future, and to mentally travel in subjective time. They found that activity in different brain regions is related to chronesthetic states when a person thinks about the same content during the past, present, or future."